I think every 9-year-old has sat in the back of his or her mom's Chevy Suburban at one point and daydreamed about the food they wished McDonald's served. Curly fries were always at the top of the list, right? While the Golden Arches has staked its claim as the best fast-food fry provider, curly fries remain the best fry subcategory, overall. Duh. Now these worlds have collided to create beautiful, coiled fast-food symmetry: the McDonald's curly fry. 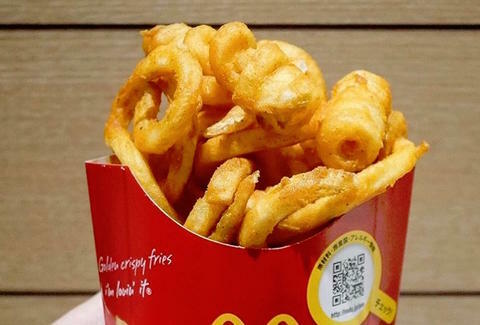 Fortunately, you now know that McDonald's does indeed serve thick, greasy, super-savory curly fries it calls "Twisters." Unfortunately, you also now know this news comes from Japan. In case you don't have a map handy, Japan is far, far away from the United States. Its rendition of curly fries debuted in 2015 on a limited basis, being removed from menus after a few months. But after the noted popularity of the first run, McDonald's has brought them back. Japanese social media and fast-food fans all over the globe are now expressing their gratitude. This, combined with McDonald's Hong Kong-exclusive Oreo dessert menu, proves that Micky D's Asia is catching all the breaks with fast-food novelties we actually want to eat.